Plato and the Creation of the Hebrew Bible for the first time compares the ancient law collections of the Ancient Near East, the Greeks and the Pentateuch to determine the legal antecedents for the biblical laws. Following on from his 2006 work, Berossus and Genesis, Manetho and Exodus, Gmirkin takes up his theory that the Pentateuch was written around 270 BCE using Greek sources found at the Great Library of Alexandria, and applies this to an examination of the biblical law codes. A striking number of legal parallels are found between the Pentateuch and Athenian laws, and specifically with those found in Plato's Laws of ca. 350 BCE. Constitutional features in biblical law, Athenian law, and Plato's Laws also contain close correspondences. Several genres of biblical law, including the Decalogue, are shown to have striking parallels with Greek legal collections, and the synthesis of narrative and legal content is shown to be compatible with Greek literature. All this evidence points to direct influence from Greek writings, especially Plato's Laws, on the biblical legal tradition. Finally, it is argued that the creation of the Hebrew Bible took place according to the program found in Plato's Laws for creating a legally authorized national ethical literature, reinforcing the importance of this specific Greek text to the authors of the Torah and Hebrew Bible in the early Hellenistic Era. This study offers a fascinating analysis of the background to the Pentateuch, and will be of interest not only to biblical scholars, but also to students of Plato, ancient law, and Hellenistic literary traditions. Russell E. Gmirkin is a writer, researcher, and Dead Sea Scrolls scholar living in Portland, Oregon. He is the author of Berossus and Genesis, Manetho and Exodus: Hellenistic Histories and the Date of the Pentateuch (2006). 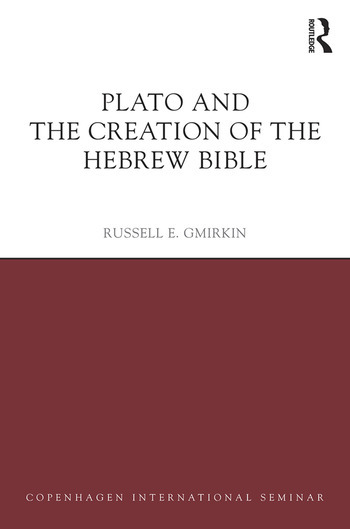 "In this book, Russell E. Gmirkin has produced a brilliant demonstration of the Hebrew Bible’s dependence on Plato’s Laws, with a focus on the Pentateuch. The demonstration is remarkably clear and convincing, and I am confidant that the theory proposed will be discussed favourably among biblical scholars, and also among classical and philosophical scholars."